April 11, 2019 |by Storage Etc. Renting a storage unit during a move is a genius move. That extra bit of space a storage unit provides can do wonders for organization and, ultimately, your sanity. Here at Storage Etc., we’ve laid out some ways you can simplify your move by taking advantage of your storage unit. 1. Remodeling, Updating, or Expanding? Painting your new place or waiting for the cabinets or closets to be finished? Not to worry! Your storage unit is the perfect spot for items you can’t bring with you just yet. Plus, with fewer boxes lingering around, you’ll be ahead of the game on moving day. 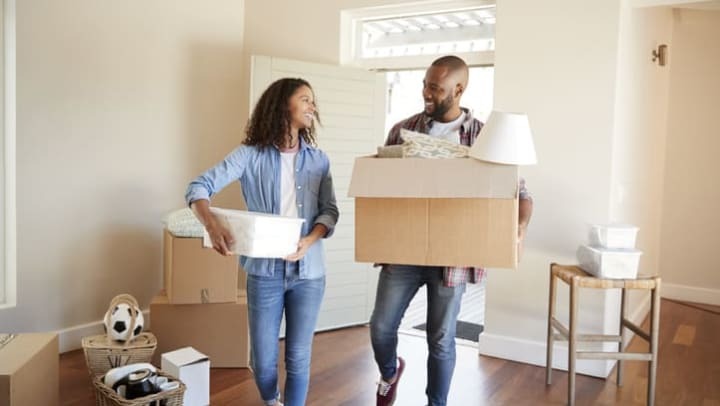 The beauty of this is that you can move in the packed-up dishware or linens, or anything for that matter, at the pace you are ready to unpack and organize them. It’s all at your pace. Whewww! Moving into a smaller home or from a house to an apartment? This is where your storage unit comes into play! If you’re downsizing but want to hold on to the piano, the second car, or even your vintage fabric collection, storage is the place to keep these items. Maybe you haven’t decided if these items are going to a family member, a friend, or maybe sticking with you. With a storage unit, you can focus on the rest of your move and save these decisions for later. When you put your home on the market, you’ll likely have to clear out any clutter and stage it in order to sell it. But what do you do with all that stuff when you’re preparing to sell? Easy – turn to your storage unit. You can even pack up your extras and have them ready to move to your new home, but get them out of the way for now. Your Realtor will love it when they stop by and see that you’ve scaled down the personal photos and art, extra furniture, and decorative accessories. If you’re schedule is jam-packed with life’s commitments, adding a move to your plate can be the last straw. With a storage unit, you can relax and make the timeline your own. Anything that doesn’t potentially need to go with you, things you want to sell or give away, even just those items you don’t want to decide on right now – take care of it all on your timeline with a storage unit. You’ve been meaning to organize your antique collection or your priceless baseball cards. Your impending move is the perfect time. Not sure yet if they need a home temporarily or longer? That’s OK! Temperature-controlled storage units are perfect for valuable things that are susceptible to the weather. They are regulated at a perfect temperature to maintain the condition of your items. Check out Storage Etc.’s available climate-controlled units that will keep your collections in prime condition all year long. For more ways to make the most of your self storage unit, head to the Storage Etc. blog.